Due to the fact that the text editor MS Word is updated almost every year, like his brothers, product, new innovations, additions and extensions. For example, after a long transition from version 2003 to version 2007 Microsoft Office decided to replace the standard doc extension to a more perfect docx. Of course, the company is moving forward, making progress, but users of different versions of MS Word deadlocked: files version 2003 open in a new editor with a note limited functionality and Vice versa. Soon new update for version 2007, which gave the ability to update files that were not compatible with the new version of the program. An interesting fact was discovered soon after the release of Office 2007for MS Word 2003 was created a small utility that allows you to open files saved in the new version of the program. If you saw in the window title inscription "the Regime of limited functionality", open the file you will not display any changes you may make to this document. 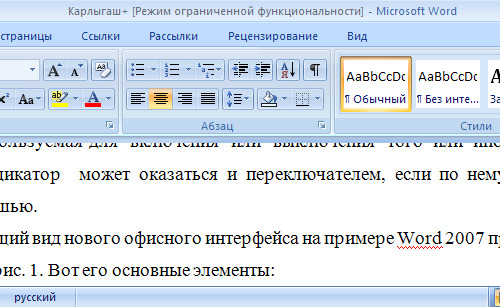 This is due to the fact that in the new version of the document applies a different formatting styles, etc. To convert the document to a new file format, click the Office button, then click "Convert". In the dialog that appears you must confirm your chosen operation. Roughly speaking, the program again saves your document to a new file. Also there is another way, if you bring the file version 2003. Install on the second computer is a tool that will allow you to save documents in the new format without losing the overall format and display text. Can the file save in 2 formats to suit for a single computer, and for another, too.